Why are you getting sued when the other driver was at fault? It is not uncommon for parties to dispute who was careless, as in the case of an accident at a traffic light in which both parties believe they had the green light. This can result in you being sued when you believe the other party was at fault. If you find yourself in this situation, you should turn over the issue to your insurance company as soon as you can, because as part of your insurance policy they are obligated to hire an attorney at their expense to defend you. If you have a set of losses, such as medical bills, if you had to go to the hospital, or if you missed time from work, you need to also collect this information and tell the attorney defending you as soon as possible. 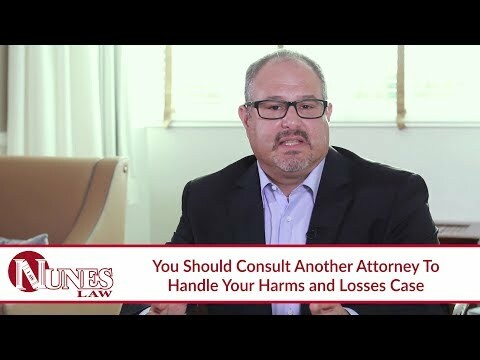 The reason is that this attorney cannot represent you in your quest for compensation for harms and losses, but will want to coordinate with the separate attorney you hire for this purpose. This second attorney will submit what is called a cross-complaint. Your insurance company’s attorney and the attorney you hire will want to file the response and the cross complain at the same time, so it is important that you convey the above information in a clear and timely manner. If you find yourself being sued, be sure to identify what harms and losses you have suffered in case you will want to file a cross-complaint along with your insurance company attorney’s response. Watch the video to learn more. If you have questions about accidents and injury claims or would like to discuss your legal matter, I want you to call me at 559-436-0850. I welcome your call. Or, visit our website at http://www.NunesLaw.com to reference our educational library.